As his father takes on the Naxals in Chhattisgarh, Sopan Khosla has scored his own victory. Son of a senior paramilitary official undertaking anti-Naxal operations in the state, Sopan has topped the CBSE Std 12th exams in the Science stream with 99 per cent marks. The student, whose father is Indo-Tibetan Border Police commandant Sandeep Khosla, has secured hundred per cent marks in four subjects namely Mathematics, Physics, Chemistry and Computer Science in the central board results this year. He scored 95 per cent in English. In total, Sopan secured 495 out of total 500 marks. Sopan's father is leading a battalion of 1,000 men undertaking anti-Naxal operations in the Rajnandgaon district of the state and he rarely gets to meet him. 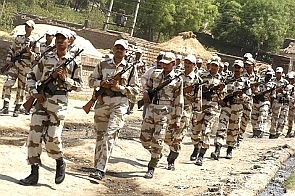 Sandeep Khosla commands the 29th battalion of the paramilitary that is based in this district. "I was not expecting this result. I expected 97 or so but this result has really excited me," Sopan said. He, however, misses the presence of his father. "I get to meet him only once in three-four months when he comes home. Throughout his career, he has been posted in difficult areas like Jammu and Kashmir and those affected by Naxal violence. He was very excited when I told him about the result. I miss my father's presence and guidance at times," he said. Sopan is a student of Delhi Public School in Jabalpur, a city in neighbouring Madhya Pradesh. But where is the heart to fight the Maoists?